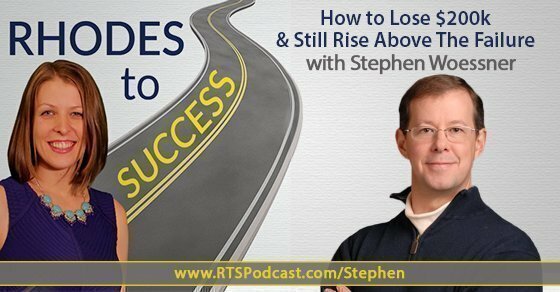 On this episode of Rhodes to Success, I interview Stephen Woessner, who is a digital marketing authority, entrepreneur, speaker, educator, podcast host, and bestselling author of two books. During the show, we discuss how Stephen used his business fail to level up, how failure in business affects family, unpaid interns, daily kick start calls, and mentorship. Share your story of attending VaynerMedia. Tell me about what your event was. How did the event failure affect your personal life and family? How did you get out of the stressful time and get back on your feet? Did you get to a point where you had to declare bankruptcy, or did you have to rebuild what you already had? What are the pros and cons to having unpaid interns? This was the challenging time and situation that could have ruined or devastated Stephen’s business. The event had been in planning from 2012-2014, and was budgeted at $2M, including speakers and the Ritz Carlton Orlando contract. The value proposition of the event question was never answered. When the event opened for registration, 3 seats out of 350 were sold. The event was scaled back and speaker contracts were cancelled, but they still lost $200K, of which $100K went to the Ritz Carlton for rooms that were never slept in. Lack of a marketing strategy. It’s hard to be a good mentee without being defensive. A good mentor will hold your feet to the fire and tell you what you don’t want to hear. Stephen was on a plateau and used it to jump to the next level. Once Stephen worked through the depression and mourning period, he and his team got back to selling. Failure also hits team members hard, so this needs to be considered too. The effect on family and relationships after a huge failure is also significant. Nothing cures the ills in a business or depression more than wins and successes. Predictive ROI has 2-4 unpaid interns per semester, as well as ‘super interns’ who are paid $600 per week for 30 hours. So far, there have been 22 unpaid interns through Predictive ROI. At one point Stephen had an unpaid intern managing six unpaid interns. She is now the multimedia producer. The company is fully transparent about who is an intern, but doesn’t micromanage. What they didn’t get done the previous day. What they need help on. If they have spare time. Everyone can instant message all team members. There are channels for discussion threads. This takes a lot of communication off email and into the tool. There is an app for phones and computers.